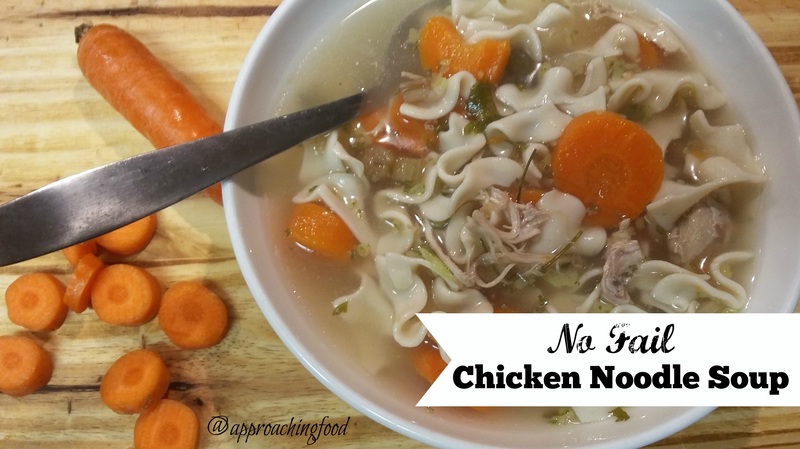 No Fail Chicken Noodle Soup: A Great Recipe for Both Beginner Cooks AND Experienced Foodies! This is some ‘soup-er’ tasty soup! My very sweet mother-in-law has been staying with us for a few weeks, to spend some time with her new grandbaby. Unfortunately she isn’t in the best health, so I’ve been trying to make nourishing meals that also pique her appetite. One day she really wasn’t feeling well, due to the side effects of the drugs that she is on, so I decided to make some chicken noodle soup. I mean, that’s the ultimate food to feed someone who is ill, right? And that’s why I came up with the recipe for my No Fail Chicken Noodle Soup! It’s such an easy recipe, that you can make it while caring for a newborn. 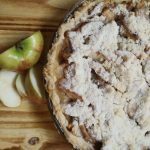 You can be a beginner cook or an experienced foodie and either way, you’ll love the recipe! Usually I serve soups with different types of quick breads. Case in point, the day I wrote this post I served an Irish Soda Bread with the Lentil and Bean Soup that I made for dinner. But this No Fail Chicken Noodle Soup doesn’t need an addition, since it has such a lovely flavoured broth, combined with shredded pieces of real chicken, chunks of carrots and celery, and delicious egg noodles. After I served this soup to my mother-in-law, she perked up! She told my husband that it “brought her back”, and indeed she no longer had to lie on the sofa as she had all day, but was able to sit up and interact with the baby. Warm, comforting, nourishing, and easy to make — what else can you ask from a soup? So, shall we make a batch? 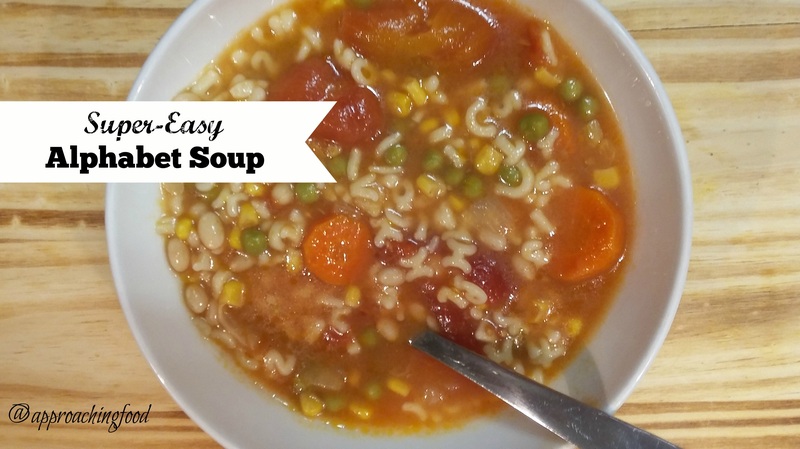 This nutritious soup is full of flavour, and bonus, easy to make! In a large stock pot, fry chicken in butter until golden brown on the outside. Add all other ingredients, except for egg noodles, and bring to a boil. Reduce heat, but keep at a low boil, for 30 minutes. Remove chicken, shred using two forks, and add back into soup. Add noodles, reduce heat to medium low, and boil for 10 more minutes, or until noodles are tender. Serve and enjoy! Next Post: I’ve been toying with the idea of making a tofu version of the Lemon Chicken Schnitzel that I grew up with. What do you guys think? Would you be interested in that? Or maybe Tex-Mex Potato Wedges? Linking up at The Clever Chicks Blog Hop! This entry was posted in Soups on December 31, 2018 by Margaret. These cookies are special, as they have both a fresh gingery bite, and a chocolate caramel kiss! Last year I made Gingersnap Cookies, and used both powdered ginger and fresh ginger in the recipe — it had a delicious bite to it! This year I decided to up the ante, and added chocolate kisses. But I used caramel filled chocolate kisses, just to make it that much more special! The result? Chocolate Caramel Ginger Cookies! The cookies themselves have no refined sugars, as the recipe calls for molasses and maple syrup as sweeteners, so the chocolate caramel kisses add just the perfect amount of sweetness to make the cookies a treat as opposed to an everyday sort of cookie. I used black strap molasses as that is what I had in the house, plus it’s higher in iron than regular molasses, so why not? 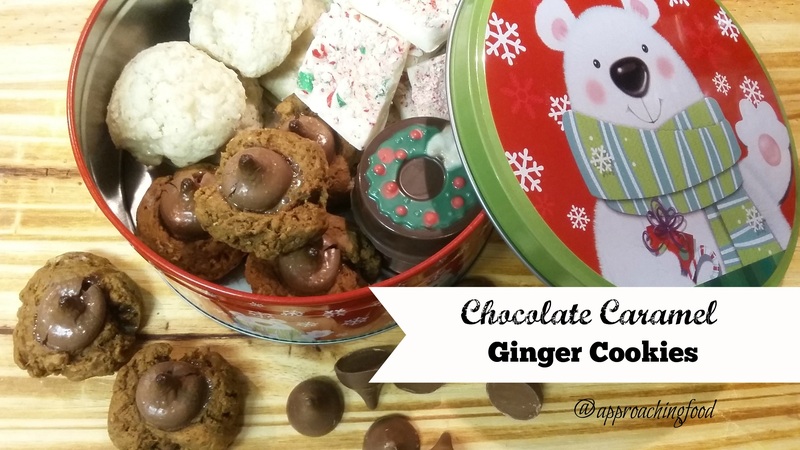 These cookies take a spicy gingersnap cookie and up the ante by adding in chocolate caramel kisses to make them even more special! Mix all dry ingredients together. Mix all wet ingredients together, and then add to dry ingredients and stir until fully mixed. Roll into small balls and place on a silicone sheet on a baking tray. Press an unwrapped chocolate caramel kiss in the centre of the cookie dough. Bake in a pre-heated 325 degree oven for 12 minutes, or until the bottom of the cookie is lightly golden. Remove to a cooling rack, let cool, and enjoy! I baked these cookies to give away in cookie tins as Christmas gifts and/or hostess gifts, but after giving away a few tins…I have to confess I ate the rest, in the wee hours of the morning when the baby was particularly fussy and I wanted some sugar. Actually, as I type this, the baby is sleeping on my chest (and I’m slightly contorted trying to type and keep the baby balanced. New motherhood, eh?). Given that the only refined sugar is in the chocolate kisses, and the rest of the cookie is pretty healthy, I’m ok with eating a few cookies during the witching hour! When do you crave cookies the most? Let me know in the comments! 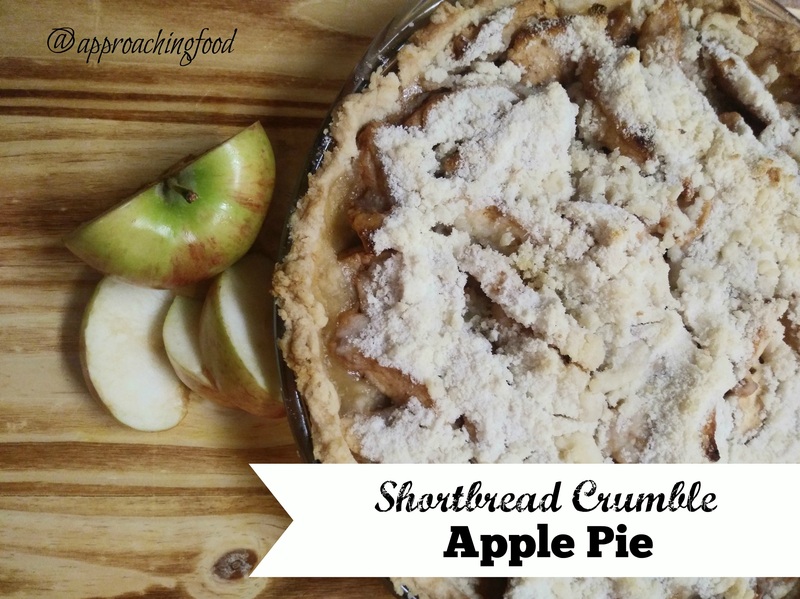 Next Post: Shortbread Crumble Apple Pie, or Easy Peasy Chicken Noodle Soup. One or the other! This entry was posted in Cookies on December 16, 2018 by Margaret.